In ancient times, the area was known as Kālia – an ʻili in the ahupuaʻa of Waikīkī – that runs from the present Halekūlani Hotel to Piʻikoi Street (generally, makai of Kalākaua Avenue.) Pi‘inaio Stream was the dominant feature of this eastern area of Waikīkī. At the turn of the 20th century, portions of this marshy wetland were determined to be “deleterious to the public health in consequence of being low, and at times covered or partly covered by water, or of being situated between high and low water mark, or of being improperly drained, or incapable by reasonable expenditure of effectual drainage”. A portion of this was owned by the Kamehameha Schools Bishop Estate who reportedly sold 50-acres of this “unproductive” “swamp land” for $25,000 to Walter F Dillingham in 1912. At the time this was real money and people questioned his decision. Dillingham’s Don Graham was the force behind the design and development of the center. It proved a success after its opening, and relocated retail away from downtown Honolulu. At the time of its opening, Ala Moana Center had 680,000-square feet of leasable area, with 87 stores on two levels and 4,000 parking spaces; and was considered the largest shopping mall in the world. Original stores included anchors Sears and Shirokiya, plus locally-owned The Slipper House. The center doubled in size in 1966 to 1,351,000-square feet of leasable area, with 155 stores and 7,800 parking spaces. New stores included anchor tenants JC Penney and Liberty House. Other phases of expansion and renovation occurred over the years so that today, with 2.1-million square feet of retail space, Ala Moana Center has over 290 stores, including 70 dining options, nearly 10,000 parking spaces and is the world’s largest open-air mall – with shopping for the basics to the elite brand name. Today, Ala Moana Center is one of the top grossing, highest occupancy rate and sales per square foot malls in the US and welcomes 40- to 60-million shopping visits per year. Changes are again underway at Ala Moana, with redevelopment of the former Sears site to accommodate Bloomingdales and other shops – this will add another 340,000-SF of retail space and another 1,000-parking stalls. Some of Ala Moana’s original tenants are still in the shopping center: US Post Office, Territorial Savings Bank, Longs Drugs, Reyn’s, Watamull’s, Shirokiya and Foodland. Oh, about Dillingham’s questioned $25,000 land buy back in 1912 … the City and County of Honolulu 2013 assessed value (for just the land) is $355,455,200. 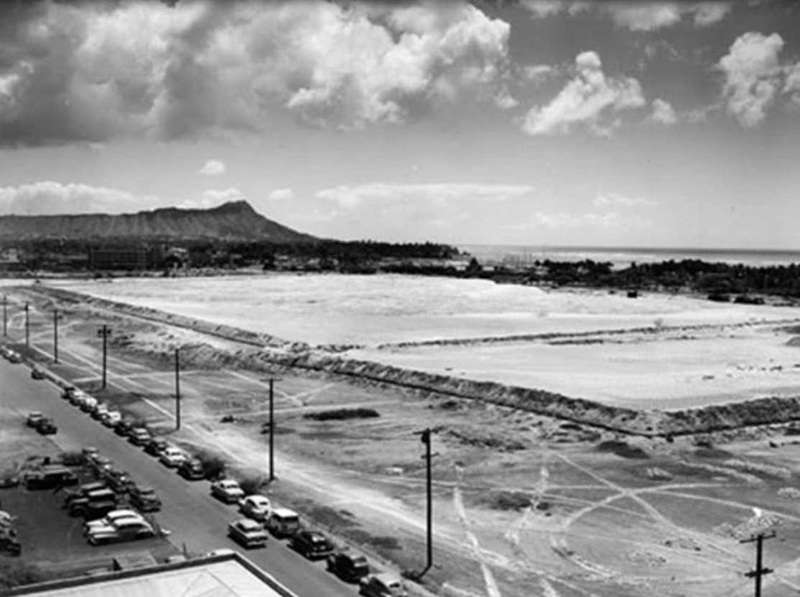 The image shows the vacant coral-filled site of the future Ala Moana Center. In addition, I have added other images to a folder of like name in the Photos section on my Facebook and Google+ pages.